I’m thrilled to have the opportunity to write to Winnipeg’s real estate community about two exciting initiatives in St. Boniface Ward, which I represent on city council. First, after nearly two years of work, council passed the new North St. Boniface Secondary Plan. The neighbourhood north of Provencher Boulevard has had a document guiding development and land-use planning since the 1970s, updated more than once since then, including most recently in 2007. The community has had a longstanding vision of de-industrializing the area and making it into a thriving hub and home for Winnipeg’s francophone culture. Industrial activity was the source of great prosperity for the city of St. Boniface for many years. For a time, this activity was mixed throughout the residential areas of the community. Since the mid-20th century, however, there has been a concerted, community-led effort to reconcile the conflicts between industrial land-use and residential communities. The effort was to ensure industry, especially heavy industry, moves into the Mission/St.Boniface industrial parks, and the redevelop the vacated land into much needed luxury and affordable housing in this increasingly desirable, historic neighbourhood. The new secondary plan recognizes the understood need for mixed density, in order to create the necessary population density for safe parks, a thriving commercial sector along Provencher Boulevard, and a pedestrian-oriented way of life mere steps from downtown. Factory site has opened up a very large property for medium- or high-density housing — subject to the public hearing and rezoning process — the owners or buyers may pursue. Piece by piece, the St. Boniface of the 21st century — a vibrant, dense, diverse, prosperous and thriving community — is taking shape. As the way has been cleared for private-sector investment, so to are the city of Winnipeg and federal governments investing in the neighbourhood. This fall, the Promenade Tache project cleared a final hurdle for construction to begin this winter. This core infrastructure project will stabilise the Riverbank on Tache Street, fix the sidewalk and provide other lighting and street enhancements. The private sector is contributing $1 million thanks to the Winnipeg Foundation, while the federal government is providing $500 000. The project invests in our riverfront from from Provencher/Tache to behind the St. Boniface Hospital, protecting Winnipeg’s primary dike and preventing further loss of Tache Street to the river. The project will be a major facelift to the St. Boniface riverbank, which currently has a sidewalk in desperate need of repair. 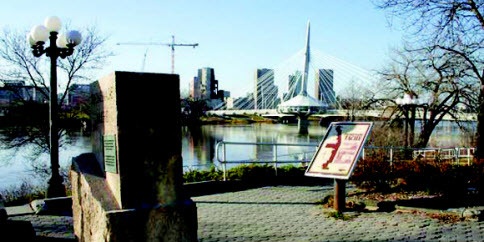 The riverbank is one of the major destinations for tourists and Winnipeggers, alike. This project is transformative and will move Winnipeg in a direction that celebrates active transportation, Winnipeg’s French Quarter, and will provide an additional profile to our beautiful Esplanade Bridge and our amazing Canadian Museum for Human rights. Together, the city, the real estate community and St. Boniface residents are building what I believe will be among the best and most desirable neighborhood in Winnipeg.